Fire is a natural force that has shaped grasslands for millennia, and it remains crucial for managing and conserving tallgrass prairie today. Fire also inspires and captivates the human spirit. Can grassland fires also be used to produce art? 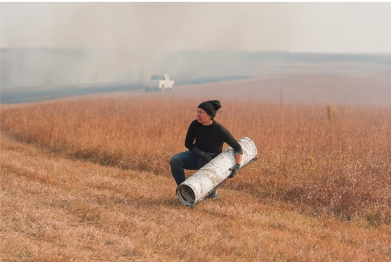 Erin Wiersma, Associate Professor of Art at Kansas State University, is exploring how recently burned prairie can be used to bridge art and conservation and create a greater public awareness of the land. When Wiersma, who is originally from New Jersey, moved to Kansas, she brought her studio outdoors and developed an artistic relationship with the land and the environment. 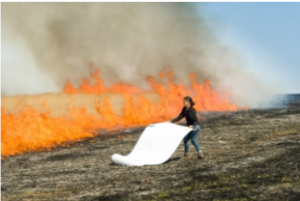 She creates large-scale drawings by direct contact with the charred remains of the prairie following controlled burns. Visually the work results in a drawing that is reminiscent of the expansive prairie and visible growth patterns, while creating dialogue around local conservation efforts and the urgent need for native prairie grasslands. Wiersma recently previewed her work at the Marianna Kistler Beach Museum of Art on the Kansas State University campus as part of the Prairie Studies Initiative program. The Konza Prairie Biological Station (KPBS) includes experimental prairies burned at different intervals as part of the Konza LTER program. Wiersma uses KPBS as her studio. She creates her drawings using the charred plant matter and ash left after a prescribed fire, by pulling/rubbing/dragging/lifting paper in recently burned prairie. Creating these works involves many hours on-site, walking the land to develop an awareness of the prairie landscape, and its responses to the wind, temperature, humidity, and changes over geological time.